Two leading business names will speak at an upcoming event about how Innovation and Investment is key to driving forward Yorkshire’s economy. 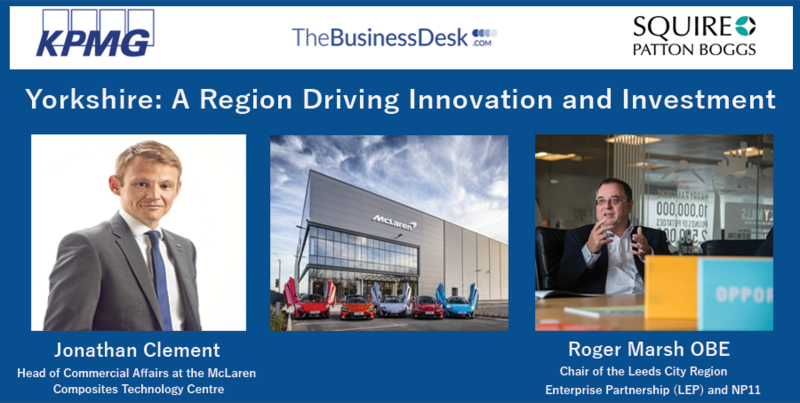 Jonathan Clement of McLaren Automotive, which recently opened its major £50m facility in South Yorkshire, and Roger Marsh OBE, Chair of the Leeds City Region Local Enterprise Partnership, will share their insights about why firms are locating in the region and what they look for when doing so. Clement will update the delegates on the importance of being at the cutting edge of innovation, with skills and investment being key to the success of McLaren Automotive’s growth. His responsibilities at the McLaren Composites Technology Centre include the supply chain for materials, tooling, equipment and services. Marsh has led the LEP through a period of significant transformation, securing the country’s largest Local Growth Deal settlement – bringing in excess of £1bn of investment to the region. He also spearheaded the #4sparks campaign to attract Channel 4 and is on the Leeds City Region team for the prestigious Regional Entrepreneurship Acceleration Program (REAP) run by MIT to bring about significant economic and social change in the region. As chair of the newly formed NP11, he leads the 11 Northern LEPs to work with the Northern Powerhouse Minister and support the Government’s vision for the Northern Powerhouse. This event, which is free to delegates to attend, is the launch of the 2019 State of the Region project, a six-month in-depth project examining how individual business sectors drive the Northern economy. Supported by KPMG and Squire Patton Boggs, the campaign is running for its second consecutive year and will explore topics including skills, manufacturing and family business throughout the six-month period. This launch event will give delegates the opportunity to network with up to 100 delegates, as well as hear about some of the most exiting investments and innovations in Yorkshire. Please note that places at this event are limited and priority for places will be given to non-professional firm representatives.